There is an update on Our Polk County Dogs. 75% of these dogs have been SAVED!!! I am so very Sorry They were Not all saved and we were not able to get to them in time. Rest in Peace Sweet Pups!! Please view the above link for detail. I wish to Thank All of You who Signed and Shared this Petition Around the World. Everyone of You of AWesome and Our Love of Animals will ALWAYS Prevail!!! TOGETHER WE CAN DO ANYTHING!!! WE ARE THEIR VOICE!!! 69 dogs were rescued from the October 2014 dog fighting ring, should not be "put down". These animals have been forced to endure horrific conditions through no fault of their own and by the hands of a convicted felon who was ordered to not have anymore dogs. This felon was arrested in 2006 and 138 dogs confiscated from his dog fighting ring. What happened to the 138 dogs from 2006, we pray will not be the same fate for these 69 dogs. We hope this man and woman get the Maximum penalty for this crime as Animal Cruelty is now a felony. Obviously, the slap on the wrist with this felon prior, did nothing to keep him from being a repeat offender. Past animals rescued from these terrible dog fighting rings, such as the Victory Dogs and the #367 survivors, have proven that they are able to be rehabilitated with love and training and be adopted into loving homes. Trying to sort through these dogs while they are in Animal Control is not the best way to assess these dogs. Even a well mannered dog, when put in that environment will eventually sucumb to being fearful, aggressive or worse. It is not fair to condemn these dogs simply because of the life they were forced to live. This dog-fighting ring bust is the second arrest for convicted felon, Hewitt Grant. 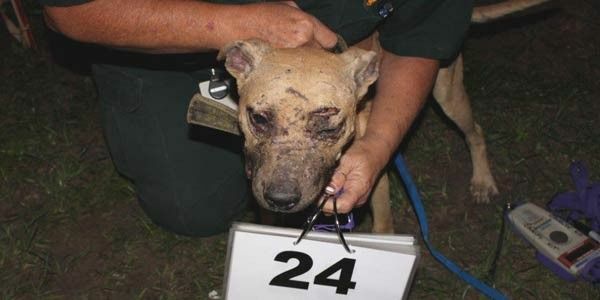 In 2006, he was arrested and his dog fighting operation busted up in Polk County, FL. 138 dogs, including puppies, were confiscated, deemed aggressive, and killed. They were never given a chance and we do NOT want the same fate for the 69 dogs confiscated last month from Hewitt Grant's second dog fighting ring to be killed. It is immoral and horrific the amount of abuse these dogs suffered under Grant's control. How sinful - they are rescued from these evil people, only to be killed??? Mike Vick's dogs, now known as The Victory Dogs, are proof that these dogs are redeemable and able to be rehabilitated. The #367 Survivor dogs are also a testament to these fighting dogs. Assessment of any animal in a shelter or Animal Control environment is not accurate nor reliable means of assessment as these animals have been taken out of their environment and placed in an environment that is stressful to them and promotes fear. We want these dogs to have a fair chance at a life they should have had all along!
. We are signing this petition because of our love of animals and to attain justice for these 69. It is inhumane how these dogs suffered and were rescued only to be "put down". Something is very wrong with that picture. Please, please Save these 69. We, the undersigned, are asking that these 69 dogs, rescued from the October 2014 dog fighting ring, not be "put down". These animals have been forced to endure horrific conditions through no fault of their own and by the hands of a convicted felon who was ordered to not have anymore dogs. This felon was arrested in 2006 and 138 dogs confiscated from his dog fighting ring. What happened to the 138 from 2006, we pray will not be the same fate for these 69 dogs. We are signing this petition because of our love of animals and to attain justice for these 69. It is inhumane how these dogs suffered and to be rescued only to be "put down". Something is very wrong with that picture. Please, please Save these 69. There is some awesome news for the dogs rescued from the Polk County Dog Fighting Ring in October. 75% of these dogs have been saved and transferred to other animal welfare facilities where they will be rehabilitated and the goal is for them to eventually be placed in loving homes. Thanks for All you shares and signatures on this petition!!! TOGETHER- WE CAN ALL MAKE A DIFFERENCE!!! WE ARE THEIR VOICE!! !